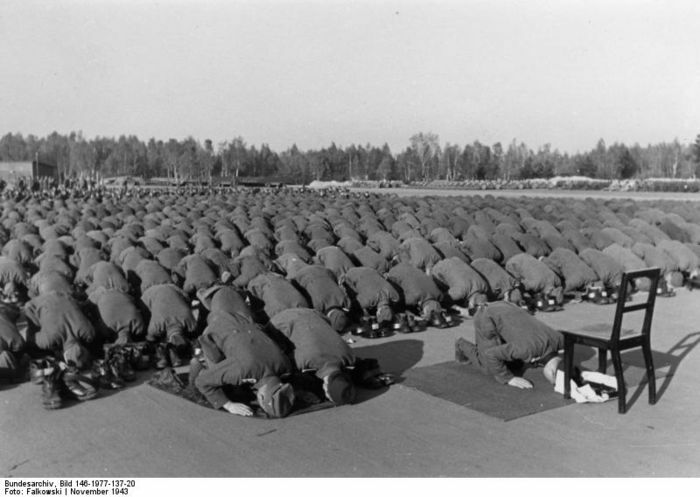 Nazis (National Socialists) and Muslims didn’t just have a lot in common, they worked together – then and now. Precisely at the moment when Pope Pius XII and the Catholic Church in Rome (and throughout Europe) was saving thousands of Jewish lives, Hitler had a cleric broadcasting from Berlin who called for the extermination of the Jews. He was Hajj Amin al-Husseini, the viciously anti-Semitic Grand Mufti of Jerusalem, who resided in Berlin as a welcome guest and ally of the Nazis throughout the years of the Holocaust. Hajj Amin al-Husseini has inspired two generations of radical Islamic leaders to carry on Hitler’s war against the Jews, which is why today, as was true 60 years ago, it is not the Catholic Church that is the great threat to the survival of the Jewish people; it is Islamofascism. Officially known as the 13th Waffen Mountain Division of the SS Handschar (1st Croatian), the first non-Germanic SS Division was also referred to as either the “Kroatische SS-Freiwilligen-Division” (Croatian SS-Volunteer Division) or the “Muselmanen-Division” (Muslim Division). Yet the Waffen SS Division was best known as simply the Handschar Division, named after the Turkish fighting knife or short sword carried by Turk policemen and soldiers during the centuries that the Balkans were part of the old Ottoman Empire.